An American Patriotic Boy Dressed in Red, White & Blue! An American Patriotic Duo Dressed in Red, White & Blue! 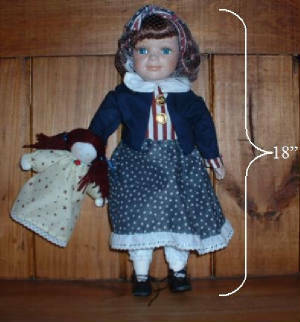 An American Patriotic Girl Dressed in Red, White & Blue! This ad is for both Dolls, but you can purchase only one if you wish, it's up to you!!! We have both to offer for only $34.99 or you can purchase them separately for only $19.99 each. These sell as high as $50.00 each. Just click on the "Buy it Now" button to purchase them separately. What every you wish. This Patriotic Duo will steal your heart because they represent what we all believe in; our Country and way of life. Both are decked out in All American Clothing. Each have a porcelain head, hands and feet, while their bodies are stuffed polyfill. Each doll stands by themselves and are for decorative purposes only; not to be handled by children under the age of 8 years old. 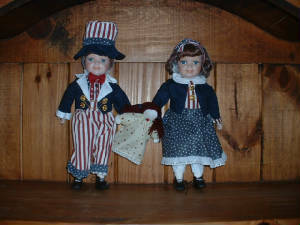 Each bidder will win 1 set or one of each, of these awesome patriotic porcelain dolls or if you wish, purchase only one of them. We at TJ6 Enterprises can't think of a better gift for your favorite biker. 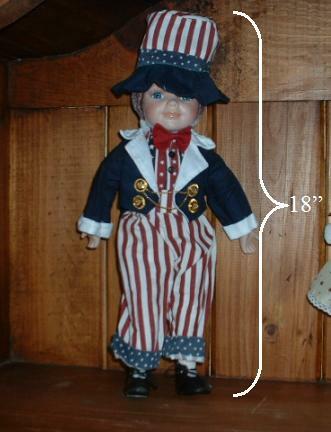 As a veteran of 28 years, I am proud to offer such a great patriotic doll to represent us all. DEDICATED TO THE MEMORY OF THOSE LOST IN WAR!!! Shipping and handling for this item is only $7.95. We recommend that you use PayPal to pay us so you get your order as soon as possible. We also accept payments by mail with money orders, cashier checks and personal checks. My wife Jennifer and I are lifetime members of VFW Post 9972 in Sierra Vista Arizona. If there's anything we can do for you, please feel free to contact us at tangles99@earthlink.net.